Smart Thermostats That Can Control an Electric Radiator: What Are Your Options? Smart thermostats are popular for a variety of reasons. The most relevant is that we all are attempting to go green. Energy efficiency is a draw when it comes to smart thermostats, even if you may not recycle every piece of plastic. Phone apps are all the rage. So, of course, most smart thermostats have gone in the same direction. The ability to control your radiator from work is not only convenient but exciting. Nest Learning Thermostat 3.0 is so smart; it learns your routines. Your parents’ thermostat did not even alert them when you left the door open to cool the neighborhood. The Nest offers a link to your electric radiator that comes with the thermostat. It also is Wi-Fi friendly so you can utilize the full technology it has to offer. The Tado Smart Thermostat v3 is not only compatible with Andriod and iOS, but also with your technology savvy best friend, Alexa. The setup makes it easy for your smart thermostat to control your electric radiator. It also learns your routine, making life easier and one less thing to make you worry. Tado even takes the weather into account when automating its settings. 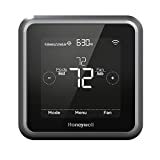 The ability to wirelessly connect to your electric radiator, Honeywell Evohome connects to heaters in every room of your home. Each room is set to a specific temperature to suit the person who lives in the room. You do not have to endure sweltering heat mid-winter because your child may have a cold streak. 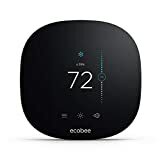 Ecobee4 is the newest addition to Ecobee’s line of smart thermostats. 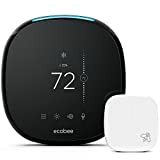 While Ecobee4 does not offer many of the bells and whistles that others do, it does control your electric radiator through a Wi-Fi connection. The draw of the Ecobee line is that it does not empty your pockets. However, cheap is rarely better, if you can afford it. The era of green living is upon us. Regardless of what smart thermostat you are in search for, the money saved is worth the investment. It has the ability to be controlled from the recliner to Middle Earth. The idea that an appliance learns one’s schedule not only saves energy and dollars but is also not something many people believed would ever become an affordable option. Nest claims that its learning thermostat saves enough energy to pay for itself in as little as two years. The market flooded itself with smart thermostats, and the choices are overwhelming for everyone. Models, ratings, salespeople, forums become mere words before you are ready to make the final decision on an expensive investment. You should also find a thermostat that fits your specific household needs. Is it comfortable and does the investment pay off in the end? Do you need to reduce energy usage while saving money in the long run? Is the thing easy to use? No one wants to wrestle with a not-so-smart thermostat. You may want to narrow down your specific needs for your smart thermostat. Controlling your electric radiator is the first. But, there is more to consider. Or any other smart feature you may need in your day to day life. We at Protect America pride ourselves in 25 years of business and long-term professional relationship. We are prepared to answer any question, concern, or walk through professionally.